Pick one. One-and-done or repeating purchases. In simple terms, a customer is a one-and-done type and a client is someone who repeatedly uses a specific product or service. In financial terms, a client is worth more money! As a business owner, I’m definitely more interested in clients than customers. Maybe I’d be OK with customers if I sold something that costs a bunch of money, but that’s not the case. Firstly, because I don’t have a product, I have a service. Secondly, because my incredibly valuable service does not land in the “costs a bunch of money” category. However, if I did sell something in the “costs a bunch of money” category, I’d still need what I need to have clients: good relationships. “Referral Instigator” is a title I’m hoping will catch on. Currently, I can say that 100% of my business is by referral – meaning that all of my clients came to me because of a relationship I have with someone else. I love working this way. For the most part, my clients are easy to work with (and for) and there’s rarely any strife. And, clients that I create a strong relationship with are more likely to refer me to others. One of the best parts of working by referral is that I can say that my best clients are also friends. How many people can say that about their customers? I will say, that working by referral is not a quick way to build a business. Relationships take time. In my favor, I have one of the world’s leading experts in referral marking as a best friend. 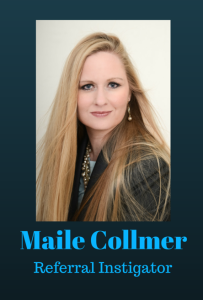 Maile Collmer built her real estate business by referral and landed herself in the top 5% of realtors in Contra Costa County. Now, Maile teaches entrepreneurs how to create a system of building the relationships that will create as much business by referral as a person could want. Generally, I prefer being a client. Basic “stuff” – things from Bed, Bath & Beyond or Best Buy, for example – gets some on-line research and then it’s seek and purchase, people get out of my way. But for things having to do with my health, friends, family, or livelihood, I’m more discriminating. I like to know who I’m working with. And here’s an example of why: When I moved out of state, I suffered shocks of several varieties. The two biggest dilemmas I had, though, were getting my hair cut and my teeth checked. I got a great referral for the haircut, I used the woman the whole time I was in South Dakota. I went to the only dentist in town and suffered several miscommunications and a horrendous appointment. One of the benefits of my lay off from that job was coming home and seeing MY dentist again. So, which are you? Do you think things might be different if you were the other? Which do you work with? 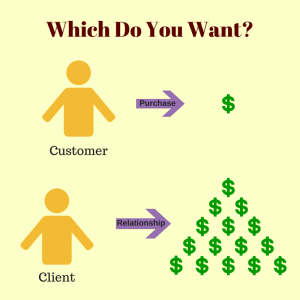 If it’s mostly customers, would you rather have clients? And that leads to the final question for this post, how are those relationships? And so, the Word Nerd threw a curve ball. I hope you enjoyed. ← What Color is Your Language?